Kiss92 FM Kiss VIP Club, Kiss92 FM Participate & Win, Singapore Kiss92 FM Contest - All The Great Songs in One Place. 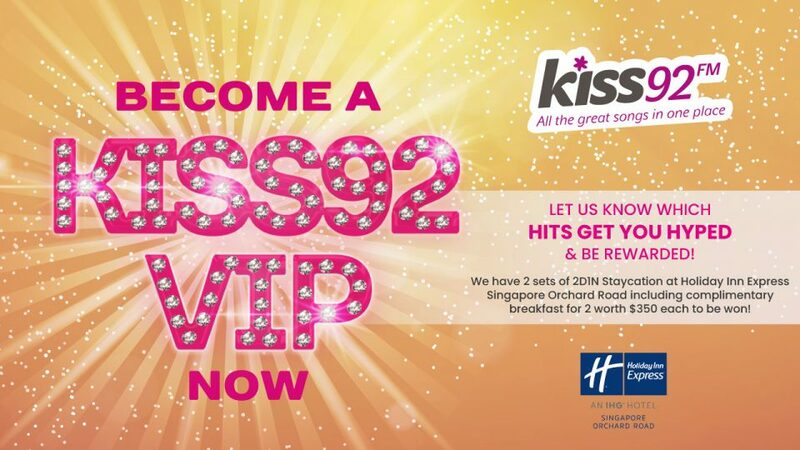 Become a Kiss VIP NOW, rate some of the biggest hits, and tell us what you think we can do to make Kiss92 even better! Stay smart in the heart of Orchard Road and discover a taste of Singapore at Holiday Inn Express Singapore Orchard Road with the new Express Local package. This staycation package includes a free mini bar of local snacks and beverages, welcome drink, complimentary breakfast, free Wifi, late check out and more! Together with seamless service and contemporary facilities, be assured of all the essentials for a great stay. Go to the VIP tab at kiss92.sg or log onto Kiss 92’s Facebook page, get the weekend party started, and become a Kiss VIP NOW!